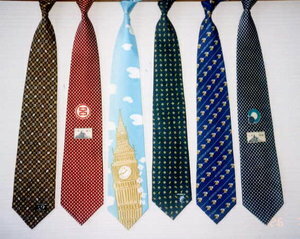 Modern neckties, shown here tied as if they were on a person, may be found in a vast range of colours and designs. 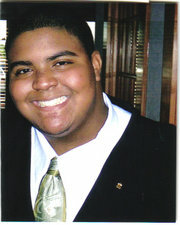 A necktie (usually just called a tie) is a piece of material worn around the neck. The modern necktie's original name was the four-in-hand tie. The modern necktie, along with the ascot and the bowtie, are all descended from the cravat. They are mainly worn by men, though they are sometimes worn by women, either as fashionable dress wear or as part of a uniform. A cravat is the neckband that was the forerunner of the modern tailored necktie. From the end of the 16th century, the term "band" applied to any long strip of cloth worn round the neck that was not a "ruff". The ruff itself had started its career in the earlier 16th century as a starched and pleated strip of white linen that could be freshly changed to keep the neck of a doublet from getting increasingly grimy. A "band" could indicate a plain, attached shirt collar or a detached "falling band" that draped over the doublet collar. Necktie fashions have changed over time. This 1818 pamphlet depicts various styles of tying a cravat. The modern form of the cravat originated in the 1630s. Like most male fashions between the 17th century and World War I, it had a military origin. During the reign of Louis XIII of France, Croatian mercenaries enlisted in a regiment that supported the King and Richelieu against the Duc de Guise and the Queen Mother, Marie de Medici. The traditional outfit of these Croats aroused curiosity in Paris on account of the unusual and picturesque scarves distinctively tied about their necks. The scarves were made of various cloths, ranging from coarse material for common soldiers, to fine linen and silk for officers. The word "cravat" comes from the French cravate, and many sources state that this is a corruption of "Croat" â€” Croatian "Hrvat". However there is evidence that the word was in use in France in the 14th century and in Italy in 16th century. In one of his ballads, the French writer Eustache Deschamps (c. 1340â€“1407), used the phrase "faites restraindre sa cravate" (pull his cravat tighter). Considering the interdependency of many European regions (particularly the French) with the Venetian Empire, and the fact that this empire at one time occupied the bulk of the Croatian coast, that type of cross-culturalization would not be unprecedented. Whatever the origin of the word the new form of dress became known as a cravate and the French were quite ready to give up the starched linen ruffs that they had been wearing and adopt the new fashion of loose cravates made of linen or muslin with broad edges of lace. A gentleman's cravat would be made of fine lace. Grinling Gibbons the famous carver and sculptor, made a highly realistic one, carved out of a piece of white limewood. During the wars of Louis XIV of 1689â€“1697, the flowing cravat was replaced, except for court occasions, by the more current and equally military Steinkirk, named for the Battle of Flanders of 1692. The Steinkirk was a long narrow, plain or lightly trimmed neckcloth worn with military dress, wrapped just once about the neck in a loose knot, with a lace of fringed ends that were twisted together and tucked out of the way into the button-hole (of either a coat or a waistcoat) The steinkirk proved to be popular with both men and women until the 1720s. The macaronis reintroduced the flowing cravat in the 1770s and the manner of tying one became a matter of personal taste and style, to the extent that after Waterloo, the neckwear itself was increasingly referred to as a "tie". Man wearing the "Q-tie" variant. 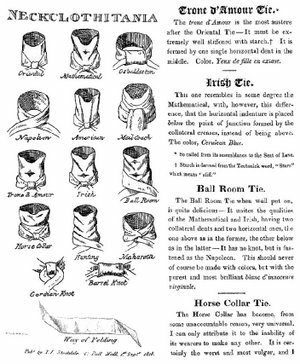 19th century: Bowtie; the process of the cravat changing into the bow was gradual, and a definite line is difficult to draw. 1850s: Four-in-hand, see below; also known as the "long tie", it is the variety most people mean when they just say "tie". 1940s: Bola tie; a tie from the Southwest United States consisting of a cord with a clasp, also called a string tie. The four-in-hand tie became fashionable in Britain in the 1850s. Early ties were simple rectangular strips of cloth cut on the square with square ends. The name four-in-hand originally described a carriage with four horses and one driver. Later it became the name of a gentlemen's club in London. Some reports state that the carriage drivers tied their reins with a four-in-hand knot (see below) whilst others claim that the carriage drivers wore their scarves in the manner of a four-in-hand, but the most likely explanation is that members of the club began to wear the new style of neckwear making it fashionable. In the later half of the 19th century, the four-in-hand knot and the four-in-hand tie were synonymous. As stiff collars gave way to soft turned-down collars the four-in-hand gained popularity. With its increasing dominance, the term four-in-hand fell out of usage and it was simply called a "long tie" or a "tie". In 1926, Jesse Langsdorf from New York introduced ties cut on the diagonal which meant that the tie fell evenly from the knot without twisting. There are four main knots used. The simplest, the four-in-hand knot, is probably used by the vast majority of tie wearers. The other three (in order of difficulty) are the Pratt knot (also known as the Shelby knot), the half-Windsor knot and the Windsor knot. The Windsor knot is named after the Duke of Windsor, although he himself did not use it. The Duke favoured a thick knot and achieved this result by having ties specially made of thicker material. In the late 1990s, two researchers (Thomas Fink and Yong Mao) of Cambridge University's Cavendish Laboratory used mathematical modelling to discover that it is possible to tie 85 different knots with a conventional tie. They found that in addition to the four well-known knots, six other knots produced aesthetically pleasing results. Today, ties are part of the formal clothing of males in both Western and non-Western societies, particularly in business. They have also found their way into the outfits of fashionably trail blazing females. Generally it is a thick swath made from silk or cotton, and is tied around the collar. The clip-on tie is a tie (bow-tie or four in hand) which is permanently tied into its knot, and which is fixed only to the front of the shirt collar by a metal clip. It is a 20th-century innovation, primarily. Many police forces use the clip-on tie as standard issue as a precaution against officers being strangled with their own tie by an assailant. A variant, especially used for bow-ties, involves an elasticated band that goes round the neck, fastened with a hook-and-eye fastening or similar. The use of coloured and patterned ties to indicate the wearer's membership of a club, military regiment, school, etc., goes back no further than late-nineteenth century England. The first definite occurrence is in 1880, when Exeter College, Oxford rowers took the College-colour ribbons from their straw boaters and wore them as neckties (tied four-in-hand). They went on to order a proper set of ties in the same colours, thus creating the first example of a College tie. It didn't take long for other colleges, as well as schools, universities, and clubs to follow suit. At about the same time, the British military moved from dressing in bright and distinctive colours to wearing more subdued, discrete, and practical uniforms. They retained the old uniforms for dress occasions, but also continued to use their regimental colours and emblems on embroidered blazer badges and ties. The most common pattern for such ties was and remains diagonal stripes in alternating colours (running down the tie from the left in the U.K. and most of Europe, rather than the U.S. preference for stripes running down from the right); the alternative is either a single emblem or crest placed centrally and designed to appear where a tiepin would normally be, or a repeated pattern of such motifs. Sometimes both types are used by an organisation, either simply to offer a choice or to indicate a distinction between types or levels of membership. Occasionally a hybrid is used, in which alternating stripes of colour are overlaid by a pattern of repeated motifs. Many British schools use variations on their basic tie to indicate the age or house of the wearer or status (e.g., prefect), or to show that the wearer has represented his or her school competitively (especially at sports). A different design is usually worn by Old Boys or Girls (alumni). Claus von Amsberg and the "Declaration of the Tie"
The Straight Dope: What is, or was, the purpose of men's neckties? Which tie knot to use when?